I just happened to catch this article on the Eddie Bauer Stores filing for bankruptcy. The brand has been around for quite sometime and as you read about it, it's a fascinating story. It seems Eddie got his store started in 1920 and handed it off to his son and another investor in 1960. Later the son retired and sold it off to another company. Over time the brand was built up to be associated with the great outdoors. I don't think I ever bought anything there but the stores always had a great look. It's amazing how a brand like this can continue onwards decades after the death of the founder. In earlier part of this decade, the brand's current owner, The Spiegel Group, wanted to do some marketing that would once again try and get the brand to be associated with the outdoors by sponsoring a film with the National Geographic group on the anniversary of the expedition of Lewis & Clark. It's quite interesting to see what this company was doing with their marketing. It makes you wonder when you are marketing your business, what you can do to reach out to your community. How you can do many things and you need to be creative! Here is a picture of Eddie in front of his first store in 1920. 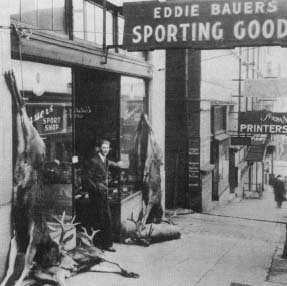 Eddie Bauer (1899 – 1986) was an outdoorsman who loved to fish and hunt. He formed a company bearing his name in 1920 in Seattle, Washington. The company originally specialized in stringing tennis rackets, but it slowly grew into the favorite place for rugged sportsmen like Bauer to purchase gear for all kinds of outdoor and recreational activities. Over the years, the business expanded to include home furnishings and business and casual clothing for men, women, and children of all ages. With over six hundred stores, twelve annual catalogs, and a much visited on-line shopping site, Eddie Bauer has staked a firm claim as one of the leading apparel and mail-order businesses in the world. Eddie Bauer files for bankruptcy - Eddie Bauer Holdings Inc. filed for Chapter 11 bankruptcy protection Wednesday, citing an inability to pay back debt. Read more about Eddie and learn the history of what he did. Maybe something in his story will inspire you! What do you think of his brand? Have you ever purchased anything at the store?